National Standard Abstract (NSA) is a family owned title insurance company located in Floral Park, NY. This year they have closed more than $500 million in commercial real estate transactions. In June, NSA closed a total of $432 million in faith-based and affordable-housing development transactions. The non-faith-based deals include the $189 million Archer Green in Jamaica, Queens; the $47 million Regina Pacis Housing in Gravesend, Brooklyn; and a $42 million project in Harlem. We spoke with NSA founder and CEO, Osei Rubie to learn more about him, his background and future plans. What led you to get involved in the title insurance industry? 14 years ago, I was refinancing my personal residence and once I realized that title insurance was required; I did not want to pay for this cost, perceiving it as optional. The bank attorney then explained that this was a mandatory cost that the bank required to confirm that they were no current defects in title, violations, liens, or outstanding judgements. I then asked the bank attorney, who happened to be a friend of mine, if he had a business relationship with the title insurance company; which led to him setting up a meeting for me to speak with them after the closing. After meeting with the company, I learned that they were not only publicly traded, but the largest underwriter of title insurance in the country. At the time I was working with a pharmaceutical company, so when a permanent position to begin as a sales executive 2 weeks after we met was offered, I accepted thus beginning my career in the title insurance industry. NSA focuses on faith-based affordable housing development projects. Why did you decide to focus on this niche? New York City’s independent churches represent a significant portion of land ownership. As a result of Mayor de Blasio’s housing initiative, developers are constantly looking for new opportunities to create development projects, leading to the partnering of the two entities to create the faith-based affordable housing market. This opportunity allowed us at National Standard Abstract to achieve our business mission in conjunction with our social mission. 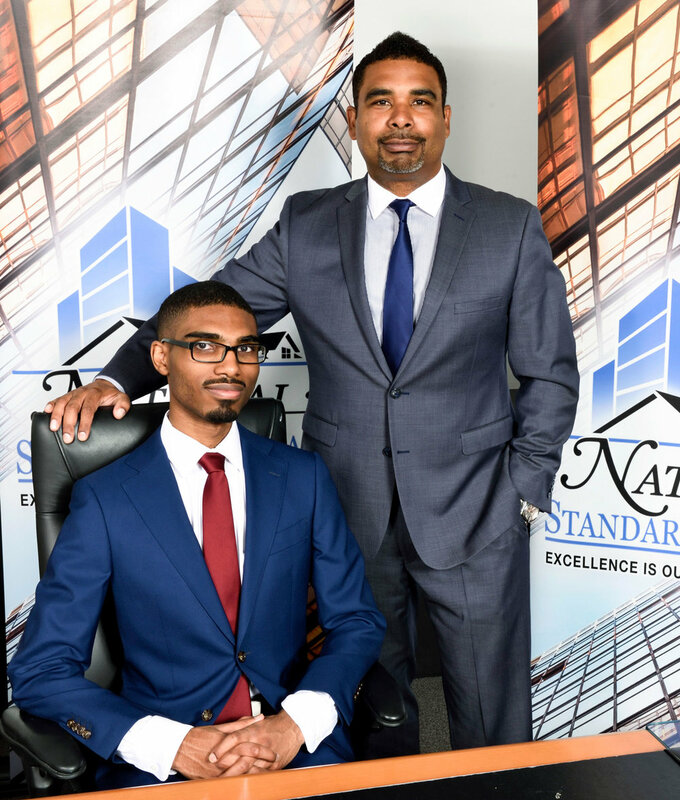 Here at National Standard Abstract we strive to identify new sources of transactions to provide title insurance; as well as focusing on underdeveloped communities and advancing the growth of affordable housing. It has been said that it takes the same amount of time to close a $100,000 deal as it does a $1M deal. Would you agree or not? The layered complexities of real estate transactions vary dependent upon the sector of real estate the specific transaction falls under, (ie: residential, commercial, affordable housing, faith-based development, multi-state transactions). There have been times where the amount of effort for a transaction under $500,000 may resemble a multi-million-dollar transaction. But normally, no I do not find it common place that a multi-million-dollar transaction and a $100,000 residential transaction, require the same amount of problem-solving and transaction focus. Your father is an entrepreneur. Briefly describe his influence on your professional life. My grandfather (Costa Rican) as well as my mother and father were all entrepreneurs, in addition to numerous other family members. We lived in Liberia, West Africa for several years during my childhood, during which my mother and father started multiple businesses that included, 3 clothing retail stores for men and women, a clothing manufacturing facility for school and military uniforms, as well as a restaurant. Upon our return to the United States, my parents were driven by the void of representation for black children within the toy industry. The passion to fill this void, gave birth to one of the first mass produced black toy lines in the country, Huggy Bean Doll. This product was in all major retailers on a national basis that sold toys (Toys R US, Walmart, Kmart, Target etc.). I was directly involved in this process during the end of my high-school career, by actively presenting new toy product lines to these retailers. This intense exposure to entrepreneurship both domestically and internationally was the ultimate training ground. In the past 5 years, what new belief, behavior or habit has most improved your life? The Power of Faith and Overcoming Doubt. When I started in title insurance, they were many comments made to me that it was unlikely that I would be able to succeed as an entrepreneur in title insurance. So much so that people would tell me that my aspirations of owning my own firm was time not well spent. In October of 2017 I was diagnosed with prostate cancer. This potentially terminal illness, also has another layer of complexity in that there has been significant advancement in technologically for this procedure (laparoscopic radical prostatectomy (LRP)). In the past, 10-12 years ago, this procedure could have a variety of results including impotence, but with new laparoscopic radical prostatectomy, this risk has been substantially minimized. I had the surgery February of this year and when first diagnosed I was told that because of my aggressive and intense schedule with my business I would need to adjust my schedule accordingly and to expect my business revenue and sales goals to be reduced. Mental and physical conditioning have always been a major part of my business and life prep toolbox. I’m happy to say that I defeated cancer this year making a complete recovery; while simultaneously having my best year in title insurance in my 14-year career. Where do you see this business in 5 years? Our goal within the next 5 years is to be the premier provider of title insurance nationally. We have provided title insurance for 2 multi-million-dollar commercial transactions in the state of New Jersey since we have begun in 2015, one for $15 million and the other for $35 million. First assemble an informal team and then transition to a formal advisory team, including but not limited to: legal, accounting, financing, and expert or experts within the field that you have an interest. By surrounding yourself with these individuals to give feedback and technical instruction on processes and procedures in your industry of interest, can maximize your ability to bypass traditional problems and errors in a startup environment, and also maximize your ability to accomplish “stretch goals” in a short period of time.